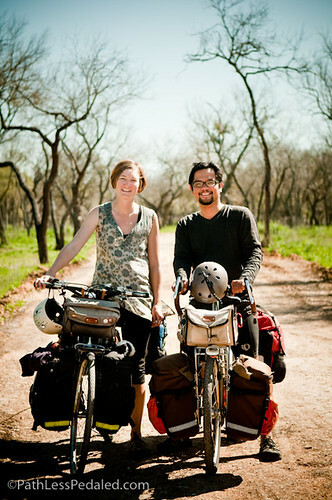 Home > Uncategorized > Austin REI Presentation – TONIGHT! Austin REI Presentation – TONIGHT! Just a reminder to all our Austin readers and friends that we’re doing a presentation at the REI in downtown Austin THIS Thursday at 6:30pm. It should run for about an hour with plenty of time for Q&A. If you definitely want to get in, we encourage you to register online for the event. We’ve missed some presentations at REIs before because of capacity issues and don’t want the same to happen to you! So please consider registering. The room holds about 43 people so it’s not huge and could fill up quickly depending on the turnout! Register:You can register/rsvp for the event here. We will also be giving away free copies of Adventure Cyclist, the magazine about bicycle touring to inspire you to go on your own adventures. A few lucky attendees may also win a FREE MEMBERSHIP to Adventure Cyclist and get the magazine for a year! We’ll also have sample maps for you to look at. In addition, we’ll also be giving away some Klean Kanteen products! Some insulated Klean Kanteens for your morning coffee and great 18oz bottles for your commute, in the office or at home. Klean Kanteen is a great responsible company that is very supportive of cycling and we’re proud to have them as sponsor! We are also cooking up some other events while in Austin. We’ll be doing another presentation and will do a S24O (sub-24 hour overnight) trip out of Austin to a local state park. More details soon. Awesome! You guys ain’t far from my neck of the woods now. Will look forward to your presentation in DFW.